The Passaic is the major river of Northeastern NJ. Its importance in the region's industrial development is incalculable. With Newark, our largest city, at its mouth, the Lower Passaic Valley is a dense urban fabric, supporting a huge population even if past its industrial heyday. Upstream of its main waterfall at Paterson, the river winds through suburbia, its many tributaries reaching into the NJ Highlands. The first 15 miles, from the river's mouth in Newark Bay to the city of Passaic, are an estuary. In Newark's Ironbound section, there is a nice walkway along the river with many prominently placed signs that depict a fish with a huge red X across it. These signs are no joke: The Diamond Alkalai Company produced Agent Orange here for the Vietnam War. Dioxins, among various chemicals, have been found in the river's sediment. These chemicals are known to interfere with gene expression, and have caused horrific deformities and other health problems in millions of Vietnamese people. The cleanup is ongoing. At Passaic, the river is impounded, and there appears to be a system of canals used to bring water power to factories. I've never been there, but I doubt they're still functioning. The Passaic River's unusual winding course - 20 miles north to Paterson then 25 miles south to the Great Swamp - is shaped by the Watchung Mountains, parallel N/S ridges that cut right through the middle of its basin. Paterson is at a gap in the ridges, where the tilted planes of erosion-resistant, basalt lava flow bedrock outcrop at a lower elevation. Upstream of Paterson, the river is flat, winding and swampy, until it crosses the basalt. Two major waterfalls, Little Falls and Great Falls, roughly corresponding to the two Watchung Ridges. Geologists believe that before the ice age, the Passaic flowed in a straighter course through another gap in the Watchung Mountains at Millburn (a few miles west of Newark). Glacial moraine, hundreds of feet thick, deposited at present-day Short Hills and Summit blocked its flow and and forced it to take the long way around when the ice melted. So the falls are geologically young, cutting their way through the basalt in just tens of thousands of years. The falls at Paterson are without question a transcendent spot: some of the East Coast's more rugged scenery, tucked away in a gritty urban park. I've heard that back in the days of pre-modern transportation, they were a popular honeymoon spot. They are also a source of tremendous water power, which brought the city industrial might, and currently host a hydroelectric generator. Extensive wetlands surround the Passaic River upstream of its waterfalls at Paterson and Little Falls for about 15 miles. They're a very rich ecosystem, a patchwork of different ecological communities including marshes, open grassy meadows, bottomland forests dominated by black gum, pin oak and silver maple, and bits of rich upland forest of beech, red maple and red oak interspersed. Bird watching in these areas is amazing. This swamp constitutes a huge chunk of undeveloped land right in the middle of suburbia. If we trust the findings of geologists, then we are compelled to interpret these bottomlands as the lake bed of ancient Glacial Lake Passaic. This lake formed as the glaciers were retreating, when the river's pre-glacial drainage was blocked by the terminal moraine, the gap at Paterson was still covered by the ice sheet, and the high ground of the Highlands to the west and the Watchung Mountains to the south and east prevented any other escape. Several major tributaries join the Passaic during its wetlands stretch, so that the drainage of a large portion of North Jersey tumbles down the falls. The tributaries drain the Highlands to the north and west, while the main steam drains the lowland basin of then Piedmont to the south. The Ramapo River is the northeasternmost tributary of the Passaic, with its headwaters all the way in the Hudson Highlands of Orange County NY. Its lower stretches follow the valley at the foot of the Ramapo Mountains' escarpment, formed by the Ramapo Fault. A gap in the mountains just over the NY border marks a change in its course. Upstream from here, it cuts a path through a deep N/S valley in the middle of Highlands. This valley and gap are a natural travel route, used by the Erie Railroad (now NJ Transit/MetroNorth) and the New York Thruway. The Ramapo River's headwaters are in swampy meadows somewhat west of the Hudson Highlands. 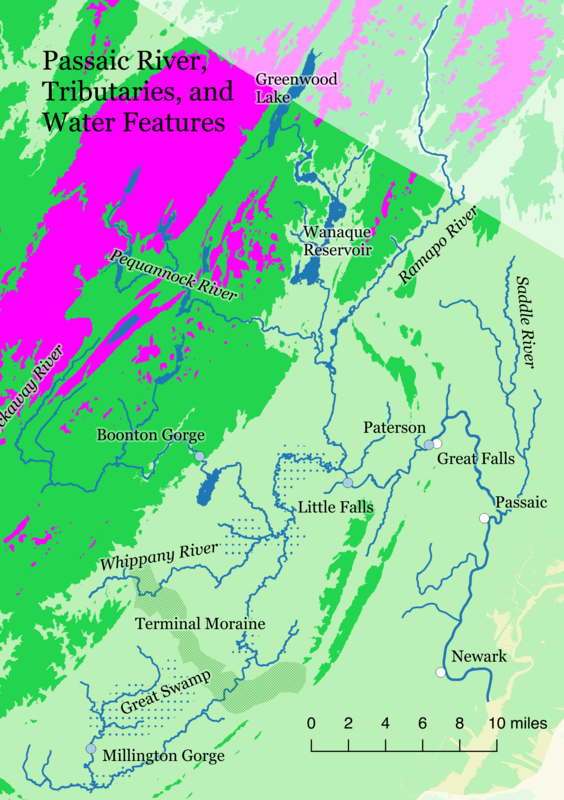 The Wanaque River comes from the north, through another deep valley in the Highlands, entirely within Passaic County. The Wanaque Reservior, and a few other impoundments, fill the bottom of this valley. Some of NJ's best hiking country is in the rocky slopes of the Wyanoke Plateau (apparently a different Anglicization of the same Munsee Lenape word) just west of this valley. Upstream, the Wanaque River cascades in a Hemlock-lined ravine through some of NJ's most rugged uplands. Unfortunately a lot of the Hemlock trees are being attacked by the Woolly Adelgid. Near the top of its watershed is Greenwood Lake, a swamp dammed in the early 19th century by iron miners, now one of the most beautiful places in NJ. The Pequannock River travels through a steep gorge from some of the highest terrain in the northwestern corner of the NJ Highlands. Its watershed reaches into Sussex County. State Route 23 and a railroad route follow its gorge - it's a fun drive. Newark's large and mysterious watershed property, with its many reservoirs and empty rocky hills, is part of its drainage. This is a clean river for NJ, apparently a good trout stream. Joining the Passaic in the a slow, swampy section, the Rockaway River has an exciting cascading section a few miles upstream at Boonton Gorge, right in downtown Boonton, where it loses several hundred feet over the course of a mile, dropping across the Ramapo Fault between the Highlands and the sedimentary basin of the Piedmont. People whitewater kayak here, and some teenagers have died in the past. Above the gorge, it has a mellow stretch in the flat, pretty Rockaway Valley. It flows through a winding basin in the highlands of Morris County, with former mill towns lining its banks: Denville, Rockaway, and Dover. NJ Transit's Morris and Essex line roughly follows it. One branch flows south from the upland area of Morris County sometimes known as the Farney Highlands, draining the Splitrock Reservoir. Other branches come from the west, the territory of the NE/SW running sedimentary ridges of Green Pond Mountain (the Green Pond Outlier to geologists). Green Pond, a wide shallow lake at an elevation of over 1000 feet, looks very scenic nestled into cliffs on the side of Green Pond Mountain; it's the headwaters of one of the Rockaway's branches. I hope to go there soon. An inconspicuous but fast-flowing "stealth river," described better in this article than I could do, the Whippany is Morristown's river. I find its stretch through the Washington Valley just west of Morristown to be a magical spot, at least partly due to a personal memory. It wanders through the swampy Troy Meadows, a wilderness hiding in plain sight in the suburbs, before joining the Rockaway. At Summit, there is a gentle gorge, which is notable after so many miles of wetlands. The river loses a bit of elevation as it digs through the glacial debris of the terminal moraine. Above this mini-gorge is a long valley a few miles wide bounded by the Watchung Mountains to the southeast and another, lower parallel basalt ridge known as Long Hill to the northwest. It contains the towns of New Providence and Berkeley Heights, NJ Transit's Gladstone Branch, and the Passaic River for nearly ten miles. A gap in Long Hill, located where the orientation of the ridge swings gradually from NE/SW to E/W, is where the Passaic first enters the valley, from the north. A small tributary, the Dead River, continues up the valley. Millington Gorge is a stretch of mild white water where the river passes through the gap. People like to canoe the Upper Passaic, and this is one of the fun spots. Immediately downstream is a swamp, and upstream is the Great Swamp. Ah, the Great Swamp. Of all of the wetland areas in the lowlands between the Watchungs and the Highlands, this is the biggest and the least disturbed. It's a basin bounded by Long Hill and the Watchung Mountains to the south and east, the Highlands to the west, and another thick pile of terminal moraine to the north. The moraine's hills force the swamp to drain to the south though Millington Gorge, but the outflow is soon blocked by the Watchung Mountains and redirected northeast, thus establishing the strange circuitous route of the Upper Passaic. Ecologically, the Great Swamp is similar to the wetlands downstream (described above). Socially/politically, it's different though: most of it is National Wildlife Refuge, with trails through the forested parts, and observational boardwalks over some of the wetter parts. As a kid, I really enjoyed walking on these boardwalks, seeing turtles and frogs and some unusual plants. There are also wildlife observation blinds that make bird watching easier. There's also the Raptor Center that rescues injured birds of prey, and a cool nursery that sells rhododendrons. During the 60s, the Port Authority planned to develop the Great Swamp as a "jetport" (similar proposals were made for the Pine Barrens). The feasibility was always questionable, but the news stirred up local opposition, led by US Representative Peter Frelinghuysen Jr., whose family estate was located near the jetport site. Slightly removed from the suburban core of NJ but never industrialized, the area around the Great Swamp is rather wealthy, especially to the north, so political lobbying at the federal level was apparently no trouble at all. Not counting a very small stream that runs down from the Highlands near Mendham, the Great Swamp can be considered the Passaic's headwaters.